You could also create the diatom chains out of no-bake clay which could then be more realistic than the proposed button model. This would be more engaging. Consider doing [link http://cleanet.org/resources/42696.html 'Activity 4A: Dead Diatoms do Tell Tales'] before you do this one, 4B. You may want to add to this by having pictures or microscope slides that show what the button model is supposed to look like. The model built by students allows them to see how paleoclimate scientists use fossils to draw inferences about the climate at the time the fossils were living creatures. 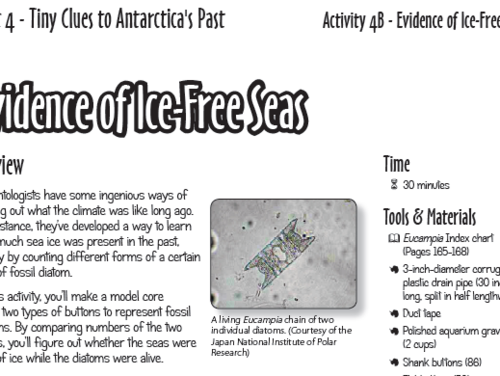 Comments from expert scientist: The text is clear (explanations and questions), the activity is certainly going to be fun for elementary to middle school students, it is easy to set up, and the accompanying sheets and graphs are very helpful. Activity is carefully constructed to pose questions and reflection at regular intervals. Excellent use of models to illustrate how scientists determine the nature of past climates. Students present results to visitors in a kind of science exhibit/presentation format. Materials for this and other Andrill activity need to be secured in advance from home or purchased from Andrill Flexhibit kit. Students should have no problem following the clear and well-written directions.